Scientific activity has always been remote from civil society, either due to a lack of scientific knowledge that makes people understand what is being done or because of a lack of disclosure addressed to a profane public on the subject. But, in recent years there has been an increase in the desire to learn scientific knowledge and know what your city has or does in this field. 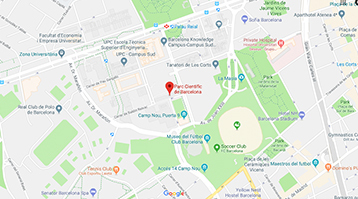 The guided visits to the Science Park of Barcelona (PCB) want to show society the work that is done and what is the mission of this foundation. The PCB is a privileged place for research, technology and innovation that allows the symbiosis of public and private entities making use of high quality facilities. This space was born in 1997 as the first scientific park of the State and today is an international reference in the promotion of innovation. And not only is science, in the visit to the PCB you can enjoy the vision of the blind artist Kelly Arrontes. The painting "Water is life" wants to show how it sees the world, given that its way of seeing it is through a "fictional water filter". It will show us how it observes the universe through the prism of water and its emotions. A 125m mural dedicated to water that will not leave you indifferent. Enter to PCB and you will feel where the most pioneering research of the moment arrives! Important: It is essential to make a reservation and make the payment. The places are limited. For reservations or information, you can call (+34) 93 17017 97 (from 9:30 a.m. to 5:30 p.m. from Monday to Thursday / 9:30 a.m. to 2 p.m. on Fridays) or to (+34) 697 864 262 (Saturdays and holidays from 10 a.m. to 14 p.m. and incidents) or send an email to reservas@sternalia.com. The activity can be enjoyed by a different person than the one who made the reservation but the amount paid is not returnable. The organization reserves the right to cancel in order not to achieve the minimum required capacity or adverse weather conditions, participants will be notified as soon as possible when the cancellation procedure begins. In this case, an alternative date will be offered. They can make their reservation by phone at (+34) 93 17017 97 (from 9:30 a.m. to 5:30 p.m. from Monday to Thursday / 9:30 a.m. to 2 p.m. on Fridays) and (+34) 697 864 262 (Saturdays/public holidays 10am - 2pm).